It is a major boost to cutting-edge research in Freiburg: in the current Excellence Strategy competition, scientists at the University of Freiburg have been granted two Clusters of Excellence, CIBSS – Centre for Integrative Biological Signalling Studies, and livMatS – Living, Adaptive and Energy-autonomous Materials Systems. With these successful full proposals, up to 100 million euros will, over the next seven years, go towards Biological Signalling Studies and Bioinspired Materials Research, which are two of the University of Freiburg's profile fields. Funding for the new Clusters of Excellence will begin on January 1, 2019. "I am delighted by this announcement, and I congratulate our outstanding researchers, whose extraordinary dedication over the past few months has made our new Clusters possible," says Prof. Dr. Hans-Jochen Schiewer, Rector of the University of Freiburg. "I would also like to thank all the staff in the university administration who have provided such great support to our Cluster Teams. This success is due to all of you, and true to our motto 'Connecting Creative Minds' proves what is possible when we transcend the borders between scientific disciplines and work together to develop new ideas. I am confident that in the coming years the two Clusters – with their creativity and passion – will bring their promising research programs to fruition and produce groundbreaking insights and innovations." With this result, Freiburg has fulfilled the requirement to apply for the second funding line of the competition as a University of Excellence. The application must be submitted by December 10, 2018. The decision on the future Universities of Excellence will be announced on July 19, 2019. "Our new Clusters have delivered and have thereby bestowed the University of Freiburg with a 100 percent success in the first funding line. We are delighted about this ideal result, which also spurs us to take on the next step. We are confident that we are also well-positioned in the competition for the title of University of Excellence," says Schiewer. Rankings such as the Funding Atlas of the German Research Foundation (DFG) that was published in July 2018 document the outstanding research performance of the University of Freiburg: they show that in relation to the number of professors and range of subjects it offers, the University of Freiburg is by far the most successfully funded university in Germany. Prof. Dr. Wilfried Weber, CIBSS – Centre for Integrative Biological Signalling Studies: "We are elated that we now have the opportunity to put our creativity into effect. With the granting of CIBSS, we are reaping the fruits of long-term strategic planning on the part of the University and the Max Planck Institute of Immunobiology and Epigenetics. Through the appointment of colleagues in complementary, forward-looking research fields and through the systematic development of an outstanding research infrastructure, we have been afforded perfect starting conditions to obtain a comprehensive, integrative understanding of biological communication processes. We are full of enthusiasm to enter this new frontier together and to develop innovative solutions for pressing challenges in medicine and in the sustainable production of crops." 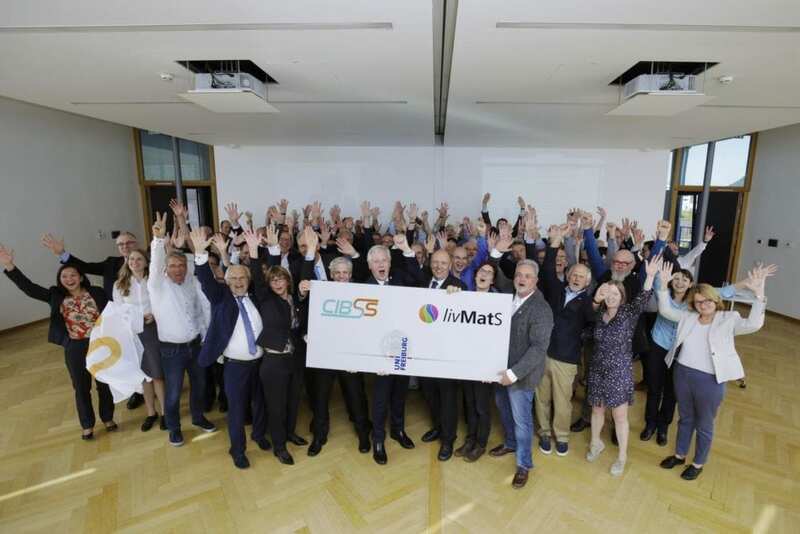 Prof. Dr. Jürgen Rühe, Living, Adaptive and Energy-autonomous Materials Systems (livMatS): "We are delighted that our concept livMatS was chosen as a Cluster of Excellence and that we can now realize our vision of entirely novel materials systems. Now it's full steam ahead with work on developing materials systems that can adapt their characteristics to their environment like living beings and also use clean energy, which they harvest from their environment. Our team will combine natural and engineering sciences and the humanities in transformative research, and further develop Freiburg's strong position in materials research." Prof. Dr. Gunther Neuhaus, Vice-President for Research: "The success of our Clusters of Excellence is further evidence that Biological Signalling Studies and Bioinspired Materials Research at the University of Freiburg are gaining an outstanding position both nationally and internationally. My thanks go to both Cluster teams and the administrative staff who support them. We have all worked intensively in the past few months. I am extremely delighted that we have now achieved our shared goal – it's a great day for all those involved and for the entire university." The success of CIBSS is founded on the University of Freiburg's strong tradition of excellence in biological signalling research, which is currently funded in several Collaborative Research Centres and the BIOSS Excellence Cluster. Building on this collaborative research, Freiburg's modern research infrastructure, and an innovative research program, CIBSS aims to establish Freiburg as an international hub for integrative signalling research. The vision of livMatS is to combine the best of both worlds: the world of nature and the world of technology. The materials systems developed by the livMatS Cluster adapt their characteristics to changes in the environment and 'harvest' the necessary energy from this environment. Life-like characteristics such as these are not generated by a single 'miracle material', but can only be realized as complex systems.